When Portuguese heir Prince Pedro decided to stay on in Rio as Emperor of Brazil, he soon realized it was just a little too warm in the summer in coastal Rio de Janeiro. So he built a palace up in the mountains, which grew to become the city of Petropolis, named immodestly after himself. Then he built Theresopolis, for his wife Theresa. Interestingly, breweries developed in the cooler climbs of the hills – Grupo Petropolis, makes of the beer Itaipava, has two mega-breweries, but they also make all-malt brands like Petra and Black Princess as well as brewing the German Weltenberger under contract. In Petropolis, Bohemia, now owned by InBev, has an impressive museum and visitor center. The smaller Cidade Imperial was owned by a descendant of Pedro’s until he sold to Grupo Petropolis in 2015. Therezopolis Brewing is dabbling in craft brewing and has built a beautiful destination educational microbrewery/restaurant called Sint Gallen in Theresopolis. 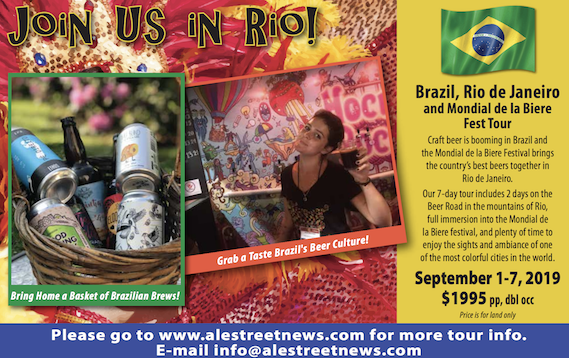 With the advent of craft brewing, and thanks to a law that prevents commercial breweries in the city of Rio, the mountains blossomed into a haven for craft breweries – and the Rota de Cerveza (Beer Road) was christened. Winding through the Atlantic rain forest from Petropolis to Theresopolis to Nova Friborgo, there are now some 40 breweries on the route, all within an hour or three of Rio. Brewpubs like Buda in Petropolis and Ranz in Novo Friborgo offer the best in fresh draft and cuisine, while microbreweries like Brewpoint and Cervejaria Real and the new Barao, bottle authentic styles.